There are many indigenous fixtures derived from the use of light materials and recyclable industry wastes. These fixtures are commonly used by farmers in livestock and poultry production. Bamboo and used tires are common materials for the purpose. Usually these are used as feed and water troughs, or containers for storage. Bamboo used in feed or water troughs for chickens is cut into a length of 2-3 ft. It is then split in half. Internode divisions are removed except at each end (Fig. 1). Several troughs are prepared and placed in strategic sites in the shed so that more birds can have access. To secure the troughs horizontally, they are nailed to flat wooden planks. the exterior rubber tire is simply cut into half sidewise or crosswise. When the rubber tire is used for the same purpose for cattle or carabao, it is cut lengthwise. Part of the middle portion of the tube is sliced to widen the opening of the receptacle. The receptacle is anchored on a stand or hung by a rope to be more stable. As storage for feeds and water, rubber tires are also fabricated into bins or large jars. The use of bamboo and used tires is considered very practical, since these are commonly available. Use of old tires encourages the recycling of waste materials. In terms of cost, they are relatively cheap. Bamboo stems used as feed and water troughs need to be cleaned regularly, as molds and algae easily grow in them. Also, if the troughs are not stable enough or relatively shallow, problems of spillage and wastage occur. The use of rubber troughs would require periodic replenishment of feeds or water, since the capacity is limited. Considerable skill is needed to make old tires into storage bins for feed or water. The use of bamboo and old tires as feed and water troughs is recommended for smallhold livestock and poultry operations. Used as storage for feeds, rubber tires are very practical. Such bins can also be used for trash. Pieces of timber are hollowed out into wooden troughs (Fig. 2). These are placed on the ground and filled with pig feed. In the old days, when native pigs were usually fed with wet feed, such troughs were in common use. The trough should be cleaned out every day. A wide-based feeding trough would be most suitable, since pigs tend to nuzzle the trough while they are feeding. The artificial milk feeder machine is used when the sow dies or is unable to nurse its own litter for some reason. By using good quality diet and simulating the sow voice, the feeder can replace the sow in nursing orphaned piglets (Fig. 3). This machine can nurse several orphaned litters simultaneously, enabling the piglets to survive despite the loss of the sow. Only if the sow is dead or unable to nurse her own litter by some accident, should this be used. Otherwise, nursing from the sow is the most efficient way to feed a litter. It is critical to keep the milk machine clean all the time. The liquid milk in the machine must be replaced quite often to guarantee its cleanliness. Farmers’ practice recorded in Taiwan, ROCFeed and feed bins of finishers, weaners and sows are given a distinctive color (Fig. 4). Labor is becoming more and more limited in rural areas. The application of productivity techniques can make operations simpler. Color-coding will make it easy for workers to understand the layout of the farm and its operations. This will avoid confusion and enhance communication efficiency when the farmer is off duty. The technique can therefore help sort appliances/equipment and individual pig houses. This can save time spent for scheduling operations on the farm. A system of this kind should be used only if the farmer has the intention to improve his management efficiency. Perseverance is critical for the successful application of the technique. A number of rings are attached side by side inside a grain trough (Fig. 5). The recommended size of the rings is approximately 20 cm in diameter. Piglets struggle with each other and shake their heads while feeding. This wastes feed. The rings prevent such behavior. The diameter of rings should be adjusted to fit the size of the pig: 10-15cm for piglets, 20-25cm for rearing pigs. Removal of the remaining feed after feeding is recommended to prevent spoilage. A used motorcar tire is split along its circumference into two halves. The inner steel ring is then removed (Fig. 6). In raising native chicken, concentrate supplements or paddy are given either in the morning or late afternoon. The split tire is then placed on the ground and filled with chicken feed or paddy. The rubber feeder is most suitable during the rainy season when the feed supplements may be contaminated with mud. The rubber feeding trough should be emptied out if wet. This is to prevent fermentation and growth of fungi. Two overhead rails are fixed to run along the ceiling of a layer barn. Two linked feed containers are attached, one to each rail. The feed containers run easily along the rails, and can be pushed along by hand. Three pipes run downward from the feed containers, each terminating in the feed trough of layer hens. As a worker pushes the feed containers along the rails, a continuous stream of feed runs down into each of the feed troughs (Fig. 7). Small- and medium-scale layer farms cannot afford to buy new feeding equipment, most of which is imported. Some innovative farms have built their own “hopper” feeder. The feeder described herein is easy to install, costs only half as much as an ordinary feeder, and saves 70% of the labor cost of feeding. Savings in labor could be expected. However, careful attention is needed to ensure a uniform distribution of feed. This feeder would be most effective on poultry farms with less than 10,000 layers. As a source of forage for animals, the fodder trees are cut to a uniform height periodically as the need arises. A certain height of the trunk is maintained so the trees can serve as a fenceline. Ipil-ipil ( Leucaena leucocephala ), madre de cacao or kakawate ( Gliricidia sepium ), etc. are forage species that are considered highly nutritious. Using them as fodder has made smallhold livestock raising sustainable. Foliage of these fodder trees remains green and is available to the animals during dry months, as they are deep-rooted plants. They are also nitrogen fixers. After harvesting the leaves and young branches as feed, for the animals, the mature branches are collected as firewood for personal use or sold for cash. Fodder trees serve as a feed bank, particularly during dry periods when forage in the pasture is scarce. These leguminous forage species are not only nutritious but are also beneficial to the soil. Usually fodder trees are planted along fencelines of a property to serve as a marker or boundary (Fig. 8). The wood serves as firewood, as a trellis support, and in the case of gliricidia, as a support for orchid plants. Fodder trees such as Leucaena are easily affected by jumping lice. Hence, availability of the needed biomass becomes seasonal. Gliricidia has a distinct odor when fresh, and therefore needs to be pre-wilted before it is fed to animals. Leguminous fodder trees are as excellent source of quality feeds, and at the same time can improve soil fertility because of nitrogen fixation. As fencelines they define property ownership and restrain straying of animals. The wood collected as firewood can easily be converted to cash. Non-leguminous tree leaves in the farm can also be used as a feed resource. Rice straw is a crop residue derived from rice production. In many parts of the region it is normally burned. In parts of the Philippines, and elsewhere where there are distinct dry and wet seasons, rice straw is collected by livestock farmers and stored as feed for lean months (Fig. 9). Usually, the straw is piled up in one corner of the farm near the animal sheds or where the animals are kept after working or grazing in the field. When straw is needed as feed, the farmer merely collects it from the pile or allows the animals to eat/browse from the pile. During dry months when the supply of forage is low, rice straw comprises the bulk of the roughage requirement. As a feed material, rice straw has a very low feed value. Thus, farmers supplement rice straw with tree leaves, and assorted legumes and grasses collected from the field on a cut and carry basis. Where available, farmers also supplement rice straw with concentrates and/or molasses, to improve voluntary feed intake and the feed value of the straw. Where available, a urea-molasses mineral block is also given as a mineral supplement during the dry months to maintain the weight of the animals. Rice straw as a feed source is easily available and can be taken free from the field. Although it is a low quality feed resource, its feed value can be improved by physical methods (chopping) and chemical methods (urea treatment, lime and water soaking). Also, the feed value can easily be enhanced by adding legumes, concentrates or urea-molasses. Rice straw can be stored for a long time, especially if it is placed in a dry shed. Considering its low feed value, rice straw is relatively bulky to transport from the field. When several animals are fed, a sizable storage area is needed for the straw. As feed for animals, rice straw needs to be supplemented or fortified with high-nutrition feeds to make up for its lack of protein and energy. One reservation for the bulk storage of rice straw in a closed shed is that it becomes a fire hazard, especially under dry and hot conditions. Collection of rice straw from paddy fields can also be a means of transmitting parasites such as liver flukes. Rice straw as a feed contains only 3.5% crude protein, 3.1% fiber, 15% ether extract, and 33.68% NFE (nitrogen free extract). Feed supplementation will not only improve the voluntary feed intake of the animal but will also improve the nutrient intake and feed value of the feed resource. A pole made from a tree trunk is placed upright in the ground, and then rice straw is piled around the pole (Fig. 10). In the dry season when no fresh roughage is available, rice straw can be fed to ruminants. The pole is used as a structure to hold the rice straw together, thus forming a haystack. A haystack of this kind cannot be built to any height without such a pole (Fig. 11). While building the haystack, the rice straw should be pressed down to reduce the bulk density, thus forming a more rigid structure. The haystack should be built on raised dry ground to avoid moisture damage. The feeding value of rice straw may be increased by treating it with urea and molasses. Feeding livestock with coconut fronds is resorted to only during dry months when the supply of forage, weeds and tree leaves is low. The coconut frond is the green woody part of the palm leaf. Green fresh fronds are collected and the leaflets or blades are removed (Fig. 12). The woody frond is cut into foot-long sizes and then peeled of its outer cover just like sugarcane. The cut fronds are split into halves and then hand-fed. Cattle and water buffalo relish the peeled and split fronds because they are soft and succulent. Backyard cattle raisers use coconut fronds as an emergency feed during dry months or inclement weather, when feed resources are limited. Through hand feeding, the animal becomes tamer and easily handled by the raiser. This feed resource is commonly available on the farm and adds bulk and dry matter to the daily feed intake. The feed value of coconut frond is relatively low. The preparation of the coconut frond as feed is relatively laborious. Also, when coconut trees have grown tall, the collection of fronds becomes very difficult. Feeding coconut fronds serves mainly to add bulk and increase the dry matter intake for the day’s ration. Fronds should mainly serve as a supplement or extra feed over and above the other feeds, forages and concentrates given. Locally called the “supak system,” this method of fattening cattle is by way of forced drench feeding, using a bamboo tube (Fig. 13). A mixture of concentrates such as rice bran or copra meal, salt, molasses and chopped Leucaena leaves are mixed together in a pail or similar container. The consistency of the mixture is a slurry or liquid. After being fed the supplement in the morning, the animal is brought to the pasture to graze. Forced feeding of cattle enables the animals to gain weight rapidly. This is not just from the concentrates themselves. The forced feeding method enhances the animals’ voluntary intake of weeds, tree leaves, coconut fronds and cane tops, and other crop residues. Another merit of the practice is that the animal becomes tame due to the constant physical handling by the raisers. It is vital for fattening that the animal is free of stress. The day-to-day handling of the animal also enables the raiser to detect disorders, abnormalities, or the presence of external parasites. Animals subjected to this low-cost technology should be tame. Vicious animals can endanger the farmer handling them. At the initial or conditioning period, feeder stocks will undergo stress due to constant agitation. The farmer should be skillful in drenching the liquid mixture to prevent choking or forcing the liquid into the lungs. The practice is rather tedious. The forced feeding method is a practice long assimilated to the culture of the Batanguenos (people from Batangas province). In fact, the tameness and the good finished condition of the animals earn the reputation of the Batangas beef as tender, with desired marbling. In fattening, keeping animals calm and in a less stressful environment and condition, contributes to high voluntary feed intake and daily weight gain. As a feeding management, forced feeding merely supplements the voluntary feed intake of the animal. On the other hand, the feeder stock should be of appropriate age, genotype and physical condition. These conditions make the animals responsive to this traditional feeding practice. This device is designed to prevent wastage of forate when dairy cattle are being stall-fed. The movable arms of this device not only support the main part but also save space in the runway. This device is composed of a horizontal bar and movable arms. The height of the horizontal bar should be suited to the position of the cattle in the feeding stall. It prevents them from shaking their heads while feeding. It is made of a metal tube, of the same kind used for the stall. The movable arms are made of steel bars. Their purpose is to support the horizontal bar and control it. When not in use, the horizontal bar is pushed back against the feeding stall, to save space. Before and during feeding, the horizontal part is removed from the feeding stall by turning the movable arms outward (See Fig. 14). Daily forage consumption of dairy cattle is approximately 10% of their body weight. However, they waste more forage as they shake their heads while feeding. This behavior wastes feed and increase feed costs. 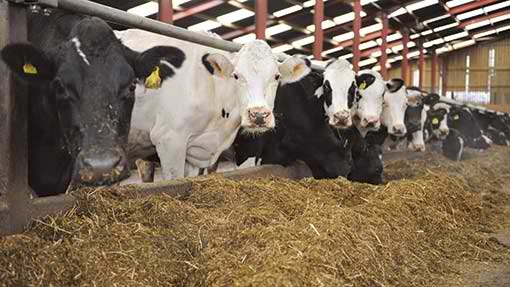 Approximately one-third of forage will be wasted because cattle shake their heads while feeding. This simple construction will help to train the cow not to waste forage. This device may be even more beneficial if it can be combined with a sprinkles system to spray water on the cow’s back during hot weather to reduce heat stress. Bundles of tree leaves or grasses are hung near walls or shed posts, where the animals can lean for anchor while eating the hanging feed. By nature, goats prefer to eat or browse on dangling foliage or roughage (Fig. 15). Their ability to stand on their hindlegs enables them to reach hanging objects. They also prefer to climb onto elevated and dry places. This practice gives the animals the opportunity to express their natural capability for bipedal stance. The animals are encouraged to eat more when feed is given in small quantities but with easy access. Hanging the feed also protects it from being trampled on, or soiled with urine and manure. The practice is practical when there are only a few animals to feed, as constant pulling of the hanged ration may loosen the bundle and eventually cause it to drop to the ground. The bundles should therefore be attached tightly. Hanging the feed in bundles is added time and labor for farmers. The practice is recommended when the herd is small and the animals are of the same size. Hanging the forage limits access by weanling or young animals. Also, this must be recommended only when forage is given merely as a supplement. The animals should continue to get the bulk of their daily feed from the pasture. The so-called native or country pigs could have originated from the wild pigs that are still common in the Philippine forests in a few provinces. The native or country pigs are mostly black in color or a mixture of brown and white, with long snouts. They have saddlebacks, scaly skin, and a small to medium body size. The majority of these animals are raised in the backyard. They are either tethered under the trees or house posts, allowed to roam in the field on a self-supporting basis, or kept in makeshift pens. Normally the day’s ration consists of kitchen refuse or food leftovers, rice bran and an aquatic creeping vegetable locally known as “kangkong” (Ipomea aquatica). Sweet potato (Ipomea batatas) tops and vines and thinly sliced banana pseudostems are also given to the animals. The bran and the kitchen refuse are usually mixed with water to form slop and then fed to the animals. The greens or the chopped pseudostems are given separately in between feeds. Despite the introduction of imported and highly prolific breeds of pigs, demand for and acceptance of native pigs are still very high. Farmers and households in the regions where native pigs are found still prefer this genotype, especially when the pigs are roasted. The native pig is well accepted as a secondary source of income, as food, and for family food security. The maintenance requirement is relatively low and the breed is quite resistant to natural elements and diseases. In the Philippines, the suckling or weanling native pigs are very well accepted and preferred for roasting, and are locally known as “lechon.” Usually the roasting stick is bamboo. The raising and production of native pigs have been limited to backyard operations with very little investment and minimal improved practices extended. Compared to the improved and modern breeds, the native pig is known to be a genetically slow grower and the production and reproduction coefficients are also low. Since the native pigs are allowed to roam and scavenge in the field along shores and in garbage, they can easily pick up parasites and microorganisms and serve as effective carriers of diseases, which could infect other animals including man. Despite the reservations on the production of native pigs, this genotype carries the genes for adaptability and resistance. These traits could be used in the future for local breeding works. Earlier researches have shown that with good selection of breeders, the performance of the native pigs improved significantly, despite low inputs made in management and technology used. There are two kinds of shells that are commonly collected from lakes, especially Laguna de Bay, one of the biggest freshwater lakes in the Philippines. These are the univalves (suso) and bivalves (tulya and paros). The bivalves are similar to the clams commonly found in brackish waters and mangrove areas. The shells are collected using specialized nets pulled by motorboats. The nets scour the lake floor to gather the shells. Small shrimps and juvenile fishes are usually mixed in with these small shells, which serve as a supplement to the duck ration. Large bivalve shells are crushed with mortars before they are fed to ducks. Ducks, particularly the native strain, are very sensitive to the quality of feed given to them. High-quality feed enables them to produce a high quantity and quality of eggs. Duck raisers in coastal areas experience a seasonal supply of high-quality shellfish. During lean months, when the supply of shellfish is low, egg production is also affected adversely. Usually raisers resort to giving commercial duck pellets. The shellfish are given to the laying ducks as a dual supplement for mineral and protein. The eggs produced are thicker and therefore shell breakage is minimal. The fertile eggs produced are very desirable for incubation. Taken all together, the products from the lake (the shellfish, the shrimp and small fishes mixed with the basal concentrates) provide a high-quality feed for the birds (Fig. 16). The ration also gives a distinct fishy taste to the duck eggs, which consumers prefer. The supply of shellfish coming from the lake is seasonal. The manner of gathering the shellfish from the lake may have a negative effect on the lake floor ecosystem. The inclusion of fresh shellfish, complete with shell, mixed with small fish and shrimps, improves the eggshell quality, the egg production efficiency, and fertility of the birds. Likewise, the “balut” (17-18 day embryonated egg) from ducks fed on fresh shellfish develops a distinct taste desired by consumers With their thick shellfish, eggs being incubated in the traditional manner have less breakage. An elevated area, about 30 sq. m. is selected for storage. This is also designated as the feeding area. The proper quantity of feed, based on the number of ducks, is placed on the area and covered with a plastic cloth. Stones are placed on the edges of the plastic to hold it secure (Fig. 17). For each feeding, the cover is lifted up to expose just the right amount of feed for the day’s consumption. After every feeding, the area is securely covered again to prevent exposure to sun and rain. It is recommended that only a one-week supply of feed is stored in this way, in order to keep the feed fresh. Silos are expensive in some areas. This type of feed storage is very simple, convenient, and can be used in areas where duck raising is a short-term activity. It is likewise inexpensive. Feed with a high moisture content is not suitable, as it will not keep for one week. The feed storage area must be high enough to prevent rainwater from seeping in. To keep the feed in good condition, it must not be kept longer than 10 days. This feeding system is usually used for meat type ducks. The seedbed is prepared by making furrows 20-30cm deep. The seeds are sown and covered with 2-3 cm of soft soil (Fig. 18). Good emergence and early development of pasture are merits of the practice. This practice can be applied to forage crops and horticultural crops. Areas with a high groundwater level should be avoided to prevent excess moisture injury. Deep-rooted grass species such as alfalfa (Lucerne: Medicago sativa ) are recommended. The bamboo dispenser stands about 3-4 ft. tall above the ground, with one end buried 2-3 ft. firmly in the ground (Fig. 19). Depending on the length per node of the bamboo, the first 1-2 nodes from the opening tip should be cleared of the internode division to serve as a container for salt. The outer skin of the bamboo is scraped slightly or perforated to allow the liquefied salt to pass through. The opening at the top of the bamboo is covered to protect it from rain. The tube is then filled up with salt to the rim, with a little water added so that the salt begins to liquefy. The inclusion of a small amount of salt in the daily ration of livestock promotes water intake and enhances physiological functions. The use of a bamboo tube as a salt dispenser makes the mineral available in small amounts. Nutritionally, salt, like other minerals, is important to life and health of the animals even if the requirement is very small. The bamboo salt dispenser is an inexpensive and practical way of making salt available to the animals. Also, there is little danger of excessive salt intake. A bamboo tube can be used as a dispenser when the number of animals is small. With more animals, the dispenser can be knocked down, especially if gored by animals. If the ground becomes very wet or muddy, the anchorage of the bamboo post to the soil is loosened, so it is easily knocked over when bumped by the animals. The indigenous bamboo tube salt lick serves the purpose of making the mineral available to the animals in small amounts anytime without danger of overfeeding. It should be strategically located in the farm near drinking spots and in areas that will not obstruct the movement of animals. The salt dispenser is basically a 1.5-2 feet long bamboo tube about 2 inches in diameter. One end of the tube is open and the other end is closed to the node. At the closed end, perforations are made with a small nail to allow the slow exit of dissolved salt from the tube (Fig. 20). It may also be necessary to scrape the outer skin of the tube to allow the natural exit of liquid through the pores of the bamboo. The tube is then filled with salt, and a small amount of water is added to initiate liquefying of the salt. The tube is then strategically hung inside the shed at a height where the animals can reach and lick it. Water is made available nearby. The indigenous salt dispenser is an inexpensive and practical way to make salt available to goats and sheep. The bamboo as a container is safe, non-corrosive, and easily available. Salt improves the water consumption and mineral intake of the animals. The presence of mineral salt in the shed or a certain location in the farm encourages the homing instincts of grazing animals. Too high an intake of salt is prevented because salt is available only in small amounts. Salt crystals can build up in the pores or in the perforations, thus hampering the exit of dissolved salts. Once the salt inside dissolves, there will be a continuous leakage of salty liquid, which is wasteful. Following the pecking order, the dominant animal will have best access to the lick. Smaller and weaker animals will have difficulty competing and getting access to the lick. While the bamboo tube is a practical way to make salt available to the animals, several licks should be made available in the shed or other parts of the farm. This will distribute the salt among the animals seeking access, and fighting will be minimized. Where there are salt licks, water should be available nearby. A large tree trunk approximately 50 cm in diameter and approximately 60 to 70 cm high is set upright. The top end is hollowed out into a bowl shape (Fig. 21). The tree trunk described above is actually a wooden mortar for husking paddy. When the wooden mortar is discarded at the end of its useful life as a mortar, it is filled with salt for large ruminants to lick. Large ruminants through their licking action cannot topple the discarded mortar. Salt is usually provided for draught animals in the evening. The discarded mortar should be dried before it is filled with salt. Charcoal is made from oak and pine trees, as well as other species. Three kilograms of charcoal is added per 300 kg of grain-feed. This is for one pig’s ration (Fig. 22). Charcoal feeding to weak pigs is a very ancient practice in the Chiri mountain area of Korea. Charcoal added to the feed of pigs with a body weight of 20-100 kg increases feed digestibility and body weight gain. It also reduces the incidence of infectious respiratory diseases and the offensive smell of swine wastes. The Haman Rural Extension Office carried out experiments on the effect of charcoal added to feed in 1996. An on-farm trial is being carried out by the same office to test quality improvements of the meat. Italian or Chinese ryegrass seeds mixed with fertilizer are broadcast onto paddy field 5 – 7 days prior to rice harvesting in October. The seeding rate of Italian ryegrass is 40 – 50 kg, and of Chinese ryegrass, 200 – 250 kg/ha. Fertilizing level of N-P2O5-K2O is at a rate of 100-150-150 kg/ha. The ryegrass is used as green fodder for cattle after it reaches a height of 30 cm. It contributes to utilization of idle land for fodder crop production in wintertime. Likewise, labor for sowing is greatly saved by direct broadcasting without seedbed preparation. Selection of a well-drained paddy field for with suitable soil moisture is essential. Livestock manure should be applied to Italian-Ryegrass in November (early winter) to help ensure that it survives the winter. Figure 1 Feed and Water Troughs Made from Bamboo and Old Car Tires. Figure 2 Wooden Pig Troughs Used in Thailand. Figure 3 Artificial Milk Feeder Machine for Orphaned Pigs. Figure 4 Diagram of How Feed Bins, Pig Pens and Storage Tanks Can Be Color-Coded for Greater Efficiency. Figure 5 Rings Can Help Minimize Feed Wastage. Figure 6 Recycled Car Tire Used As Feed Trough for Chickens. Figure 8 Tree Legumes As Fenceline and Feed Bank. Figure 9 Rice Straw As a Feed Reserve. Figure 10 Stacks of Rice Straw Come in Handy during the DRY Season. Figure 11 The Pole Holds the Rice Straw in Place. Figure 12 Preparing Coconut Fronds As Feed. Figure 15 Goats Prefer to Eat Hanging Bundles of Forage. Figure 19 Bamboo Salt Lick for Cattle and Water Buffalo. Figure 20 Suspended Bamboo Salt Lick. Figure 21 Wooden Mortar Used As Salt Lick. Figure 22 Adding Charcoal to Hog Feed Has Its Advantages.